This is a guest post from my husband. He runs a local gaming forum and frequently posts reviews for video games, board games, and roleplaying games. I thought you guys might enjoy reading his review of Cooking Mama: Cook Off for the Wii. If you want to check out more of his reviews take a look at the Windsor Gaming Resource. Excellent use of the Wii, quite a bit of fun but overall very easy and short. This is a Wii version of the popular DS game Cooking Mama. 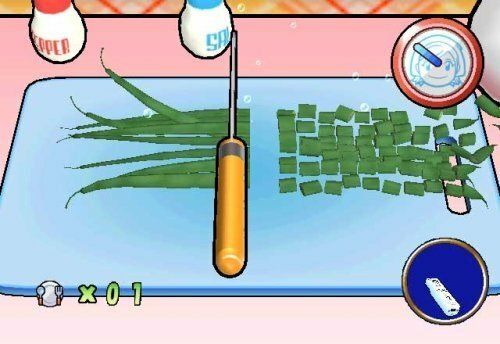 In Cooking Mama: Cook Off you cook. Who would have guessed? You start a game and are given a recipe book with only 5 recipes in it. You pick one and start cooking. Each new recipe completed unlocks a new one until you have unlocked all of the recipes in the game. 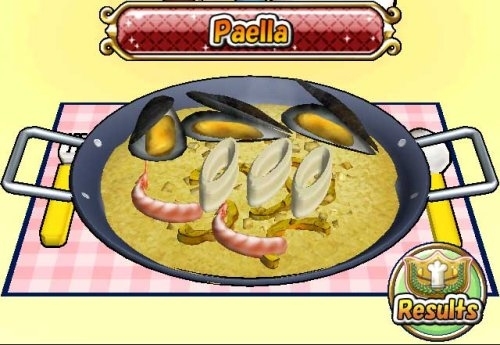 There are a total of 55recipes avialble in this version of the game. The theme is international food, so each recipe is tied to a country and features a dish known for that country. For example Mocchi for Japan, Hot Dogs for the U.S., and Pasta for Italy. So how do you cook? Well each recipe breaks down into a selection of mini games all played using a Wii Remote. Just the base remote is used, no nun-chuck needed. These mini games have you interacting with over 300 ingredients and a variety of cooling tools. Everything is pretty intuitive; you mimic the motions of actually cooking with the Wii Remote. Stirring – hold Wiimote upside down and move in a circular stirring motion. Popcorn – shake Wiimote to shake the pan, hit the button when the popping is done. Grating – hold Wiimote face up and slide quickly side to side, then shake up and down to tap the container to get off build up. Hamburger Patties – Shake Wiimote with rythm left and right to toss the patty between your hands. After each mini game you are rated on how well you did. Besides getting a score Mama shows up and makes a comment. Your goal is to get her to say “Better then Mama”. 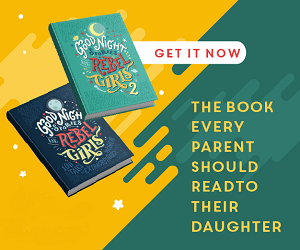 In addition to this commentary, Mama will comment while you are cooking, most of the time with words of encouragement like “Keep Going!” “Getting Better”. Finish all of the mini games within a recipe and get a screen showing your new creation and an overall score. You then get rated Try Again, Bronze, Silver or Gold. In addition to the normal recipe book mode you can play challenge mode where you try to score the best score as quickly as possible. You can do the World Challenge where you challenge cooks from around the world each making their favourite recipe. You can also challenge a friend in two player mode. In both of these competitive modes you play split screen where you are trying to complete the same recipe with a better score then your opponent. Lastly there is a practice mode where you can practice any of the mini games and perfect your cooking skills. I have to admit that I have a ton of fun playing this game. I bought it for my 3 year old but even I enjoy it. It has some of the most intuitive controls of any Wii game. Most of the time you just look at the screen see that you are supposed to stir a pot and automatically start the motions. This makes the game excellent for kids. The variety of recipes and different mini games is pretty impressive. My main complaint with this game as an adult is that there are only 55 Recipes. You could get through all of these in one sitting if you tried, or a couple sittings without much effort. In those 55 recipes there is a lot of repetition as well. You can only cut so many peppers before you get kind of tired of cutting peppers. Now neither of these seem to be a problem for the kid. She loves repetition and thinks nothing of making sushi over and over again. There is one thing in this game that really bothered my little one. That’s when Mama gets mad and gets “Fire eyes”. If you do bad enough on a mini game you get a picture of Mama who says something like “Try Harder” and shows Mama with fire in her eyes. For whatever reason this scares my little girl, who now covers her eyes after every mini game and has to ask me if it’s okay to look. I bought this for my 3 year old and while she loves it some of the mini games are a little too hard for her. I’m guessing she’s still a little young for this one, but it works out as now I get to play with her and help. Which I don’t mind doing as the game is rather fun. While mostly a kids game, adults will have fun with this at least for a short time. There’s not really enough different levels for this one to last but it’s worth a rent. If you have kids though I expect they will love it and want to keep making the same things over and over. I think this is mainly due to how intuitive the game is. It’s pretty much pick up and play. Overall, I would definitely recommend this one if you have kids that you think would be interested in repetitive play at cooking. 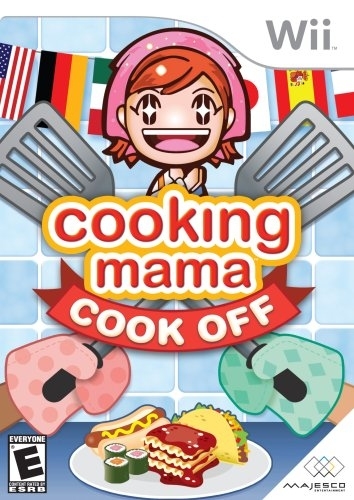 You can pick up Cooking Mama: Cook Off for the Wii on Amazon for $19.99. It’s been out for a while now, so if you keep an eye out you may be able to snag a used copy somewhere. love that your husband guest posted on your blog! fun! sounds like a fun game for boys and girls, I think the fire in the eyes for a mad mama is probably a bit much for the kiddos too! lol great review!!! Ooh thanks to your hubby for this review. I've been wondering if I should get this for my kids who love to cook but wasn't sure how hard it was. It sounds perfect! So glad you guys enjoyed my husbands review! I'll have to rope him into this again sometime soon.